Sure, the cherry blossoms at the Tidal Basin are truly breathtaking and a sight to see at least once. However, there are plenty of other places in the D.C. area that are just as picturesque. Here are five places to see the best cherry blossoms in the area, minus the crowds. American diplomat Robert Woods Bliss and his wife Mildred bought Dumbarton Oaks in 1920, standing at the highest point of Georgetown. At the time, it stood on neglected grounds. It took the Bliss’ decades to design the gardens, hiring landscape gardener Beatrix Farrand. A hidden gem for the springtime cherry blooms is Cherry Hill, featured on a slope at the bottom of the garden. Farrand’s vision at the time was to keep the cherry trees separate—allowing for a breathtaking scene just once a year. On the grounds of the largest Catholic church in the country are lush gardens. Within those gardens are over 100 cherry blossom trees. A terrace symbolizing life, beauty and hospitality is surrounded by Yoshino cherry trees, white-flowering shrubs and eight stone benches. Visitors can access the gardens, called “Mary’s Garden,” through a walkway leading from the Basilica’s north apse. The National Arboretum is a quiet oasis in the NE D.C. area. 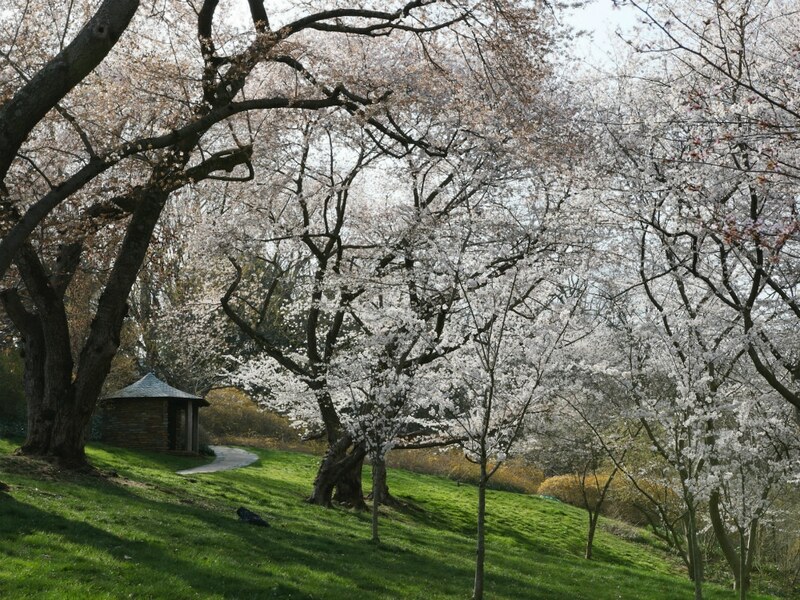 The arboretum is offering a self-guided tour called “Beyond the Tidal Basin: Flowering Cherry Trees.” The tour, which runs through April 15th, explores the almost 30 various types of cherry blossoms (including three new ones developed by scientists) at the arboretum. If you are hoping to see trees similar to what’s at the Tidal Basin, there are plenty of the sweeping Yoshinos throughout the several miles around the arboretum. The upscale neighborhood between Palisades and Georgetown is home to meticulously kept houses. The streets where Tudor-style mansions sit in the close-knit community are home to spectacular cherry blossoms in the springtime. Venturing to check them out will make you feel like you’re in an English village. In fact, the neighborhood was inspired by a trip to England by the community’s developer. English roots are shown through architecture of the homes. Also, the neighborhood is laid out with plenty of winding lanes and circles similar to those in the UK, according to a brochure from the D.C. Historic Preservation Office. Kenwood, considered part of the Bethesda and Chevy Chase neighborhood, is the perfect alternative to the at times chaotic Tidal Basin area. In the 1930s and ‘40s, a local developer planted thousands of cherry trees to add appeal to the once developing neighborhood. Now a cozy nook, Kenwood’s trees typically bloom a few days after D.C.’s peak period.